Child Trends / Child Trends News Service / Videos / Where Will Your Child’s Imagination Go Today? Where Will Your Child’s Imagination Go Today? WASHINGTON, D.C. (Ivanhoe Newswire) — In the space of just a few minutes, your child can go from being an architect constructing the tallest building in the world, to a pirate digging for buried treasure, to an explorer looking for new countries to discover. Now, new research shows pretend play can have real social and emotional advantages for kids. Playing house, cooking and serving dinner to friends, or grabbing a hard hat for a day of building new cities—a child’s imagination can be endless. 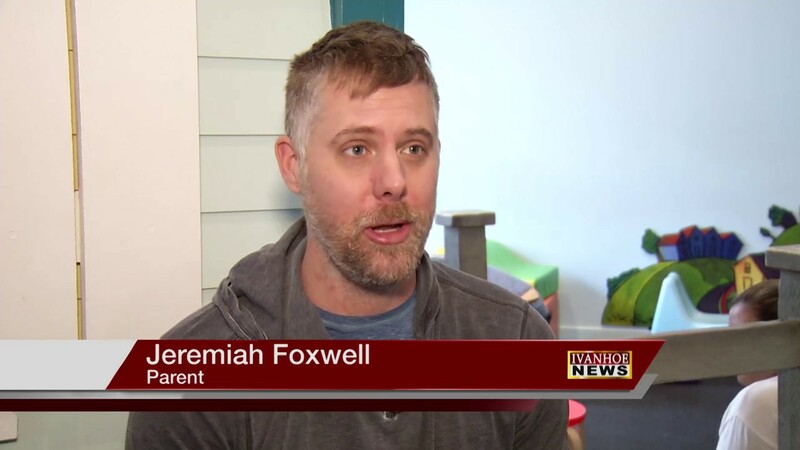 “You don’t want to tell a kid how to play, just give them the opportunity to play,” parent Jeremiah Foxwell told Ivanhoe. Developmental psychologist Thalia Goldstein, Ph.D., studied 97 five-year- olds enrolled in pre-kindergarten Head Start. The kids were split into three activity groups. One group pretended to be animals, or other people; one group was read to; and a third group built with blocks. “What we found was the children who were in the dramatic pretend-play group increased their emotional control over the course of the eight weeks,” detailed Goldstein. Researchers measured emotional control using puppets, and by looking at children’s behavior when they were under stress. In this study, the puppets were either in control or out of control. Researchers asked which puppet the kids were more like. Kids in the dramatic-play group identified with the puppet in control. Goldstein recommends parents spend at least 15 minutes a day engaged in pretend play—something as simple as pretending to be a chef, while your child is a waiter; or pretending to bake a cake, while the other celebrates a birthday. It’s make-believe play that can have real-life results. Researchers say the results suggest the potential for using pretend play as an intervention to improve emotional control and social skills and improve school readiness among high-risk kids. Thank you to Dr. Thalia Goldstein at George Mason University for providing video footage. WASHINGTON, D.C. (Ivanhoe Newswire) — En pocos minutos, un niño puede pasar de arquitecto a pirata a explorador sin salir de su cuarto. Hoy, la ciencia nos dice que estos juegos de imaginación ayudan al desarrollo de los niños en la vida real. Jugando a las casitas, cocinando, sirviendo la cena. La imaginación infantil es inagotable. La psicóloga Thalia Goldstein estudió el comportamiento de 97 alumnos de 5 años de edad enrolados en programas de intervención temprana. Se dividió a los niños en tres grupos, un grupo jugó a ser un animal o un personaje, otro grupo escucho un cuento y el tercero jugó con bloques de construcción. Determinaron que entre los niños que usaron la imaginación para representar un papel, su capacidad de control emocional aumentó en el transcurso de ocho semanas. La forma de medir el control emocional fue usando marionetas para analizar el comportamiento de los niños en situaciones estresantes. Goldstein recomienda que los padres jueguen con los hijos por los menos 15 minutos al día en situaciones donde los pequeños usen su imaginación y finjan ser algo diferente. Puede ser tan sencillo como pretender que el padre es el camarero y el hijo el chef, o el niño hornea un pastel mientras que el papa celebra su cumpleaños. Según los expertos, estos juegos pueden ser asimismo una herramienta para mejorar el control emocional y las habilidades sociales, de niños de alto riesgo, al igual que prepararlos para entrar en el colegio. Los contribuyentes a este reportaje incluyen: Cyndy McGrath, Supervisora Y Productora de Campo; Milvionne Chery, Productora; Roque Correa, Editor; Kirk Manson, Camarografo.